When Ring of Honor and New Japan Pro Wrestling present the G1 Supercard from Madison Square Garden, Rush will go up against a former ROH World Champion. 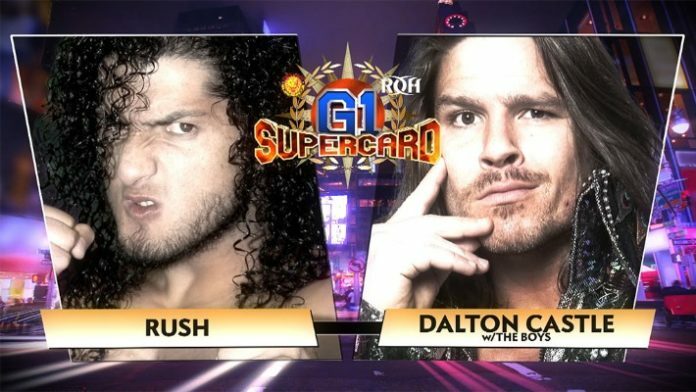 ROH recently added Dalton Castle vs Rush to the G1 Supercard lineup. Castle was on commentary for Rush’s match against Bandido at the 17th Anniversary PPV earlier this month. The former ROH World Champion cut a post-match promo directed towards Rush after the match. Rush then gestured as if he would accept the challenge. ROH has since made the match official for April 6th. Sat April 6 – LIVE on PPV & Streaming for ALL #HonorClub Members at 730e/430p! Castle and Rush have been on different trajectories as of late. Rush has been undefeated since signing with ROH earlier this year. Meanwhile, Castle has been on a losing streak which has seen him grow visibly frustrated with his boys. A win over Rush might be what Castle needs to get out his slump, however.